Storage problems in kitchen are now passé with flexible and functional ideas flooding the market. All you need to do is select one that suits you best from the large array of kitchen storage solutions. Whether you are a proud owner of a hall sized mega kitchen or own a humble small room you like to call kitchen, there is place for one and all when it comes to availability of functional storage solutions. Despite the standard base and wall kitchen cabinets hiding most of the kitchen stuff, there is always that extra stuff that needs good storage space. A free standing kitchen cabinet is the ideal way to fix your need for extra storage and at the same time not worry of space constraints. Free standing kitchen cabinets come in a variety of size, shape and colors. Even if you have a circular space where you require a storage cabinet to fit in, it is easily available. Along with that they come in a variety of materials like wood, stainless steel etc. Free standing kitchen cabinets are versatile in their use and can be easily cleaned. If you opt for such cabinets with wheels, cleaning becomes much easier as the cabinet can be moved out of the kitchen. If you have a small kitchen and have one or two free standing kitchen cabinets, you can always rearrange them to suit your space and the look of your kitchen. You could also arrange such cabinets in the lobby connecting your kitchen to the living room. That way not only does the kitchen look spacious but also creates an extension space to it. Large and medium sized kitchens have the liberty to keep such cabinets in the kitchen itself. 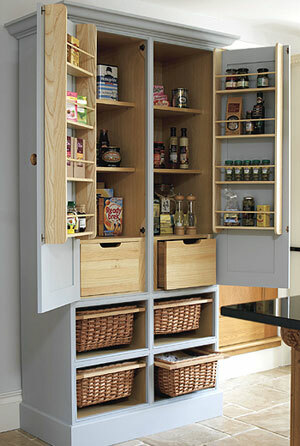 Vertical free standing cabinets are great for small kitchens as they provide storage without taking much floor space. Free standing kitchen cabinets are easily available in local kitchen hardware shops, online and specialty kitchen furniture shops. While selecting cabinets for yourself, you should focus on functionality, number of spaces provided, types of spaces provided and its ease of installation in your kitchen. Free standing kitchen cabinets are available with several shelves, drawers, wine racks, roll out trays and glass door display shelf for your expensive china. With a wide variety of choice, it is easy to find a cabinet that suits your requirement and yet fits into your budget. Most of them are easy to install or assemble. Interestingly, if the free standing kitchen cabinet has a tiled top, it can be used as an island for dining. All you need are some high chairs and you are set to dine right in or near your kitchen. In case you have a large kitchen, these cabinets can add stylish look to your kitchen as you can get extra space to arrange flowers or just some fancy show pieces. This obviously may not be possible in a small kitchen where the cabinet would be completely utilized for storage, but creativity can be applied to small and big spaces alike. Free standing kitchen cabinets come in various styles to suit your style of kitchen — like country, contemporary, French, Italian etc. You can afford to experiment the look of your kitchen if you have such free standing base cabinets and wire shelf units, as they can easily be replaced unlike the fixed cabinets, where the task of replacing fixed cabinets is not only tedious but also expensive. This is a great option if you are planning a new kitchen or giving a completely new look to your kitchen as you can plan more functionality in your kitchen with free standing kitchen cupboards. And your next change in future will also be easier as all you need is to replace them instead of having to go through a tedious uninstalling process. Key aspect is getting good storage and at the same time keeping kitchen a spacious and pleasant place to work in. So select free standing cabinets carefully to avoid cluttering too many of them. Apart from the base cabinets (in case you keep the base cabinets as free standing too or if you have fixed base cabinets) only one or two more such cabinets should solve all your storage needs. Where can I find the instructions on how to do the shelves? It would be best to ask the manufacturer of you kitchen cabinets about this. If I have an oak TV entertainment center such as this, how do I prepare it to be painted? How much is the kitchen pantry with the four baskets on this page? Can anyone tell me where the cabinet shown in the picture can be purchased? Exactly, often times kitchen lacks of storage space or simply runs out of it as the family grows bigger. Free standing kitchen cabinet sounds like a good solution for people on the budget and for those whom it may still not be enough they often opt in for kitchen extension so either solution should work. Very professionally done! Thank you for sharing your knowledge about free standing kitchen cabinets. These kitchen cabinets do tend to take up a lot of space, especially when the doors are extended. They seem best suited to kitchen island sized kitchens. (5×4 Meters) minimum.